The ANR labcom project LETRIP (Laboratoire d’Etude des Traitements et Revêtements Innovants pour le Patrimoine) is a joint laboratory between the NIMBE/LAPA (CEA/CNRS, Université Paris Saclay, UMR3685) and the A-CORROS company. It started in 2015 and is founded by the ANR (Agence Nationale de la Recherche) for three years. Its mission is the treatment and protection of the metallic cultural heritage. The objectives of this association between a public research laboratory and a private company is to facilitate the development of joint research programs to producs methods applicable to innovative industrial advances. The labcom LETRIP missions relay on two main axes. The first one aims to develop dechlorination treatments for archaeological metallic artefacts. Indeed chlorine species can be reactive when artefacts are excavated. Protecting the objects necessitate to remove them from the corrosion layers before they are endangered by this phenomenon. A-CORROS started a new process based on the immersion on alakaline conditions at high temperature and pressure in subcritical conditions. The optimisation of the protocoles depends on the metal (iron, copper, etc… based artefacts) and on the archaeological origin. The nature of the physico-chemical transformations needs to be qualified thanks to a devoted analytical methodology based on multiscale analyses developed specifically by the NIMBE/LAPA. 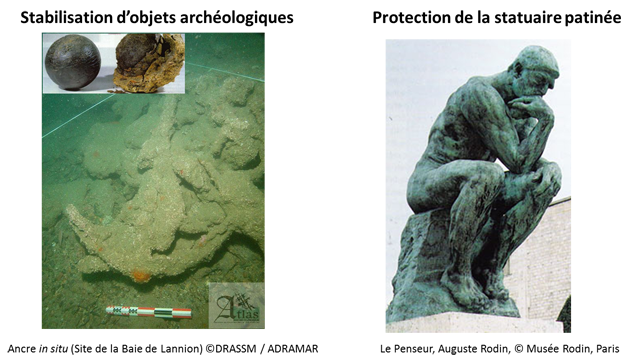 The second axis concerns the protection of metallic cultural heritage sculptures exposed on site indoor or outdoor. Organic compounds are applied on the surface of the corrosion layers already formed to render it hydrophobic. Different commercial products are currently used by curators depending on the metal (wax, BTA, carboxylate etc…) but the protection mechanisms, and particularly the physico-chemical interaction of these products with the corrosion layers are not known. The objective of the labcom is to study the chemical processes involved in these process with the help of a tailored multi-scale ethodology and to propose performant compounds that can last several years to limit the curation operations.